CHICAGO – The discovery of an outsider artist’s eccentric creations leads to the testing revelation of a public shame in “Almost There,” a definitively human documentary that mixes the idiosyncratic canvas of “Grey Gardens” with the compassion of “Hoop Dreams.” Making its Chicago premiere tomorrow night at the Gene Siskel Film Center, “Almost There” has sold out its 7:45pm screening, but tickets are still available for Sunday’s 3:00pm showing. 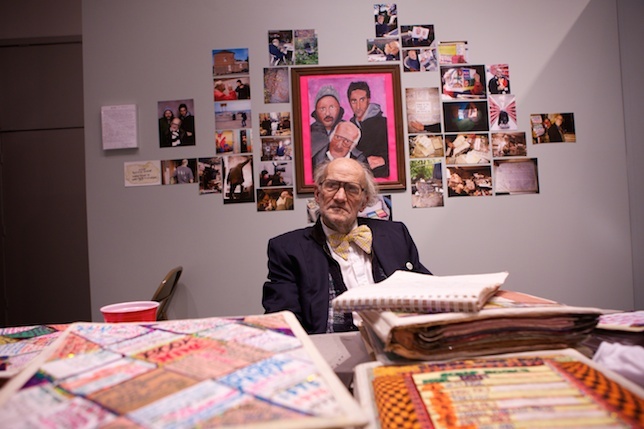 The subject of this newest project from Chicago’s Kartemquin Films (“Life Itself,” “The Interrupters”) is Peter Anton, an elderly Indiana artist living in a collapsing home that stores a lifetime of prolific scrapbooks and paintings. Peter is given a chance to share his art with the world when he meets co-directors Aaron Wickenden and Dan Rybicky, who become fascinated with the outsider artist and his treasure trove of creations. “Almost There” makes an unforgettable mark when it questions the responsibility of filmmaker to a necessitous subject, as the co-directors become increasingly obligated to Peter’s corroding living conditions, and realize that they need to draw a line somewhere. All at once, the stranger-than-fiction narrative of “Almost There” tackles issues of mental illness, the brinks of hospitality, and the way in which we understand artists who exist in worlds purely their own. In anticipation of the film’s Chicago premiere, HollywoodChicago.com talked to Rybicky and Wickenden about their multi-year passion project. Speaking over the phone, the filmmakers discussed the unique origins of the project, its influence from “Life Itself” director Steve James, the way in which Peter’s story has influenced their own pursuits as artists ready to share their work with the world, and more. HollywoodChicago: You both found Peter years ago at Whiting, Indiana’s famous (and delicious) Pierogi Fest. But when did this curiosity about Peter, his art, and his living situation feel like it could fill a feature? Aaron Wickenden: It’s a little hard to answer. The process was organic. We started out making a photography project of Peter's art, we thought that the textures and tests would all be served by making a beautiful book that people could read through. But when we were photographing the books and trying to process all of Peter’s stories, and all of his scrapbooks, we found that they jumped from one scrapbook to another, so we started to interview Peter as a way to fill in the blanks. Dan Rybicky: I think it’s like, how do you leave somebody in the middle of their story? The further we got involved it would be harder to walk away, which is what the film dramatizes. When Peter got kicked out of his house, we had been filming for four years; we felt that we were going to have to see through the arc of the whole story, whether he’s dead in a ditch or makes successful transport. I have a screenwriter background, and we could see the arc of the film at some point, even though we were upset and disturbed when the details of Peter’s life came out. There was also the part of us that thought this was a compelling issue of what do you do with artists like this, put them away? HollywoodChicago: I remember seeing by chance a completely different opening to the film when you tested it in 2011, which was around the time of Peter’s revelation. Instead of beginning with the artist, it started with you going into the house, and introducing the audience to Peter's home disaster. Wickenden: We had that other opening for a while, we call it the ‘Breaking Bad’ opening, to generate that sense of mystery of what is being discovered - why is he going back in the house? What are these scrapbooks? I guess we ultimately decided to change tactics and let Peter start his own story and let him lay the groundwork for letting the audience in, and communicating his desire to let the audience let him to tell his story. It allowed the audience to understand that it wasn’t just us finding him but that he was on the lookout for someone to do this; he wanted this story to be told. We came into his life, and not the other way around. In the process of editing the film over many years, one of the things that we did was screen the film at Kartemquin, and screen it for 15 people at time and get feedback. And doing it the film shifted greatly, which was the joy of working with Kartemquin. Rybicky: We wanted to make sure his voice was heard, and in a way that captured the tone and the spirit of what the film would be. It shows both color, but also real trouble, and I think that’s what our film is tonally. Wickenden: And we were excited that out of the gate we were doing something that audiences hadn’t seen before. And that it would be a roller coaster, too. HollywoodChicago: In “Almost There,” you paint yourselves as filmmakers who have taken on this project as a big responsibility amongst other jobs. In the midst of working on “The Interrupters,” the revelation with Peter happened. I called “Interrupters” director Steve James, and among other things he gave me a week off of editing, even though we were in the thick of things, because we were getting the film ready for Sundance. I couldn’t focus on both things at once. In so many ways, Steve has been really influential. HollywoodChicago: What wisdom did James have for ‘Almost There’? Wickenden: Steve helped us triangulate, and ask, ‘How are we coming across as characters in the film?’ Steve said that it’s important for the film to not be naive but for you to expose yourself to show your in the moment vulnerability of where you were when making the film. It’s important to communicate where we were at the time that we were making the film, and that we weren’t always making the best decision, and then at the end of the process having the perspective to put that into content. HollywoodChicago: What were some films and filmmakers that influenced this project, or kept the gears greased during the project’s long production? Rybicky: I’ve always been amazed by the way that Louis Malle personalized filmmaking, like with ‘Phantom India.’ I think that the sense of seeing how the person is motivated in making the is film is interesting to me. He has a point of view in his work and that’s personal. Other touchstones of work that really interest me because it sort of dealt with dark stuff, that sort of are funny and yet human and compassionate, were films like ‘Grey Gardens’ or ‘Marwencol’. Wickenden: We also really like to make mention of the films in the Kartemquin canon. In addition to James’ ‘Stevie’ which has so many parallels, I love the Jerry Blumental & Gordon Quinn documentary ‘Golub,’ and how its work doesn’t exist in a vacuum, but is framed by the society in which it is made and the social conditions of it. As for Peter’s work, we similarly thought you’d understand his art better by understanding the forces around it. HollywoodChicago: How has this influenced your perspective on what you want to do with your own creative endeavors while on this earth? 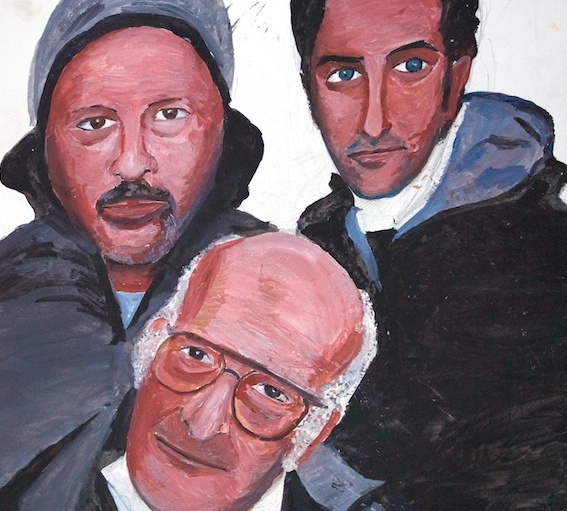 Wickenden: One of the things that Peter was hoping for was that I would communicate his own desire to persevere, whether facing physical challenges or financial challenges. I’d say more than anything that the indomitable spirit was something I’ve taken away from that project, just continuing on, doing the work. That has been extremely inspiring. Rybicky: I think for me I’ve always been attracted to the passion that Peter has and the desire to do work, that we’re all outsider artists, and that what compels them is so rooted to what they are. Peter is the sense of having to do something; I feel like we had to make this film. Like Peter, we were driven, and I can relate to that level of obsession. It’s not even about Peter, it’s something we had to do. I always do appreciate it. I’ve never felt like I had to make a film, but this is one i had to make. “Almost There” has its sold out Chicago premiere on Saturday, January 10. Tickets are still available for its 3:00pm showing on Sunday, January 11. Featuring Peter Anton. Directed by Aaron Wickenden and Dan Rybicky. Not Rated.